Rajon Rondo and Kim Kardashian now have a common enemy: Kris Humphries. - Kris Humphries bumps Kevin Garnett as KG pulls up for a running jumper. - The bump wasn’t particularly strong, but KG falls on his backside anyway – geriatrics wards in Boston were tuned in to assess KG’s status by the way. 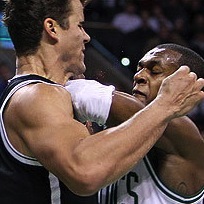 - Humphries and Rondo get into a shoving/pulling match. - Paul Pierce, Jason Terry, Brandon Bass, Reggie Evans, Gerald Wallace, and a few others enter the fray. - Some old guy at courtside gets sat on. - Apparently, someone scratches Humphries’s shoulder. - Humphries gets a T.
- Wallace gets his second T of the game, which results in his own ejection, too. latest edition of NBA basketbrawl. The whole scene looked really messy, but no punches were thrown and no bodies were slammed. Just some shoving, pulling, and scratching. After all the hullabaloo, it really wasn’t much of a brawl. 1977: Rudy Tomjanovich (HOU) vs Kermit Washington (LAL) – In what was eventually remembered simply as “The Punch,” Washington plants a solid closed-fist (after a wicked windup at that) against the face of Rudy T.
1999: Charles Barkley (HOU) vs Shaquille O’Neal (LAL) – Shaq blocks Barkley. Shaq shoves Barkley. Barkley throws the ball at Shaq. They eventually settle their differences through golf. 2000: Shawn Bradley (DAL) vs Mark Davis (GSW) – 7’6” Bradley gets into a verbal spat with 6’7” Davis. Davis picks up the German-born giant and basically POWERSLAMS him onto the hardwood. Vince McMahon still has a tape of this in his drawer. 2000: Chris Childs (NYK) vs Kobe Bryant (LAL) – Childs and Kobe share some sweet nothings. They bump chests. Childs cans Kobe with a punch AT LEAST ONCE. 2004: Ron Artest/Metta World Peace (IND) vs John Green, Mike Ryan, & AJ Shackleford(Pistons fans) – In this now-infamous incident, Artest (no way I’ll call him World Peace in this scenario) charges to the stands to assault Green, Ryan, and Shackleford. 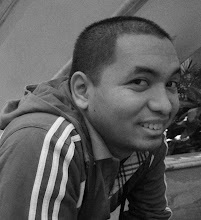 Artest was the one who actually started the whole thing (surprise!) by giving Ben Wallace a hard foul. Wallace retaliated with a shove, which sparked and on-court melee. As Artest was seemingly cooling off by the scorer’s table, a fan hurls a cup at him. He runs up to the seats to serve up some “World Peace” on whomever he could lay his hands. Artest was meted the longest suspension (resulting from an on-court violation) in NBA history – 86 games (the rest of the regular season + playoffs). Ray Allen hit a go-ahead 3-pointer with 22.6 seconds left as the Miami Heat came through with a harder-than-expected, 105-100 win over the short-handed San Antonio Spurs at American Airlines Arena. Allen scored 11 of his 20 points in the fourth quarter, while LeBron James compiled 23 points, nine rebounds and seven assists to lead the Heat to their fifth consecutive victory, though Miami needed a 12-2 run over the final two minutes to get past a gritty Spurs squad that was playing without its top five scorers. Dwyane Wade added 19 points and Chris Bosh amassed 18 points and 12 rebounds for the Heat, who improved to 7-0 at home as well and have now won 11 in a row at American Airlines Arena dating back to last season's playoffs. Gary Neal had 20 points and Tiago Splitter finished with 18 for a San Antonio team without its "Big Three" of Tim Duncan, Tony Parker and Manu Ginobili, all of whom did not make the trip for rest purposes. The Spurs were playing for the fourth time in five days. Starting guard Danny Green was also held out for San Antonio, which had taken the first five tests of its six-game road swing. David Lee had a game-high 31 points along with nine rebounds and six assists as Golden State barely survived to take a 106-105 win over Denver. Klay Thompson posted 21 points and nine rebounds while Stephen Curry added 20 points and 10 assists for the Warriors, who have won four of their last five games. Andre Iguodala had 22 points while Danilo Gallinari added 20 points and nine rebounds for the Nuggets, who have dropped their past two after winning four straight.